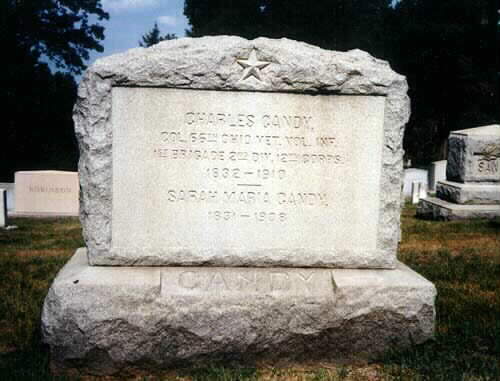 Charles Candy as born in Kentucky on August 7, 1832, and died October 28, 1910. Prior to the Civil War he served as a Private in the Regular Army and with the 1st United States Infantry (1856-1861). On 21 September 1861, he was appointed Captain and Assistant Adjutant General of Volunteers. He resigned on 3 December 1861 and was appointed Colonel, 66th Ohio Volunteer Infantry on 17 December 1861. He was breveted Brigadier of Volunteers for his war services. He commanded the 1st Brigade, 2nd Division, XII Corps (Armies of the Potomac and the Cumberland) and the 2nd Division XII Corps. He fought at the battle of Gettysburg. He is buried in Arlington National Cemetery, Section 3, Grave 1759.